While some termites live in the wood of our homes, others build their own houses, some of the most impressive structures in the animal world. Their mounds are forever-evolving cities, made from the simplest materials. Working independently, without any coordinator or blueprint to reference, they construct temperature-controlled environments that include elaborate ventilation and cooling systems, and specialized chambers that store food, contain fungal gardens, hold eggs, and house the egg-producing queen. As a colony, they are able to create worlds that far exceed their individual capabilities. The mound is constructed out of a mixture of soil, termite saliva and dung. Although the mound appears solid, the structure is incredibly porous. Its walls are filled with tiny holes that allow outside air to enter and permeate the entire structure. The top of the mound consists of a central chimney surrounded by an intricate network of tunnels and passages. Air travels through the porous walls into a series of small tunnels until it reaches the central chimney and rises up. When fresh air mixes with this warm air, the air cools and sinks down into the nest. This ventilation system constantly circulates the air and ensures that oxygen reaches the lower areas of the mound and keeps the nest from overheating. Termites do not live throughout the mound but spend most of their time in a nest located at or below ground level. It’s comprised of numerous galleries separated by thin walls. Workers are constantly repairing areas that require maintenance and adding new tunnels and corridors to the nest. 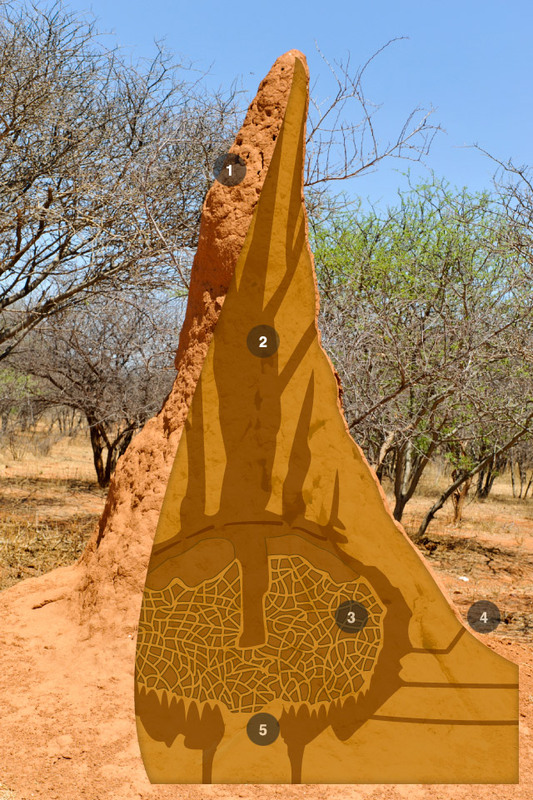 A city of termites requires a lot of food, and the mound has many storage chambers for wood, the insect’s primary food source. Termites also cultivate fungal gardens, located inside the main nest area. Termites eat this fungus which helps them extract nutrients from the wood they consume. Maintaining the fungal gardens takes precise temperature control, and the remarkable architecture of the mound keeps the temperature almost constant. The queen and king reside in the royal chamber. The queen’s sole purpose is to produce new termites to help build and protect the nest. Incredibly, the queen can produce thousands of eggs a day and live for up to 45 years, during which time she will grow to the point where she is unable to move. Workers carry her eggs to a special nursery where they are fed on compost until they turn into adults. At the base of the mound are several openings that the termites use to enter and exit the nest. Termites make forays out to collect food at night, when temperatures are cooler. Six feet below ground level is the cellar. It’s the coolest part of the structure. Its ceiling is comprised of a series of thin plates that absorb moisture from the colony above and provide another ingenious cooling mechanism. As the moisture evaporates, the temperature falls, cooling the air around the nest.